Networks using the ALERT protocol are designed to give immediate access to data that indicates the likelihood of flood conditions. ALERT stations typically are set up to acquire and transmit hydrological and meteorological data on a timed and event basis. What many users don’t realize is that Campbell Scientific dataloggers that are used to run ALERT stations have plenty of capability to spare, and that capability can be leveraged to perform a variety of services. Douglas County, Colorado, in conjunction with Denver’s Urban Drainage Flood Control District (UDFCD), operates an extensive ALERT network to monitor potential flood conditions. 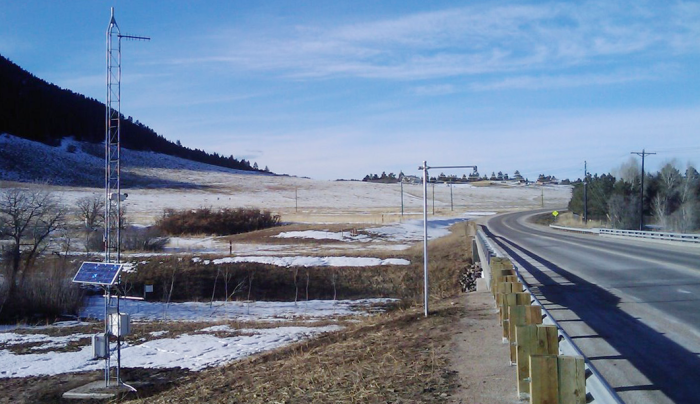 In 2008, the county decided that the next ALERT site they set up should also have a camera to monitor stream and road conditions, and a road-temperature sensor to aid the Public Works department with winter maintenance. This would give the station the abilities of a road-weather information system (RWIS). The Campbell Scientific CR1000 Measurement and Control Datalogger at the heart of the ALERT station was programmed to instruct the RF500M radio modem to transmit precipitation, water level, wind speed and gust, wind direction, and battery voltage to the UDFCD base station in Denver using the ALERT protocol. In addition to this normal flood-warning role, the CR1000 acts as a web server, using cellular communications to provide users with near-real-time images of the stream along with data for precipitation, wind speed, wind gust, wind direction, water level, and temperatures for water, air, and road surface. A staff gauge was painted on one of the bridge piers to be visible by the camera, and this can be used to verify the performance of the water-level sensors. As a public service, the CR1000 is also configured to use its Internet communication abilities to send current data along and camera images to Weather Undergound (wwww.wunderground.com). This weather station has no access to ac power, but is able to rely solely on solar power. The programmability of the CR1000 enabled use of power-saving techniques such as turning off the camera at night and powering down hungry sensors when they are not needed. Campbell Scientific dataloggers are great foundations for ALERT systems. But they are flexible enough to meet expanding needs and interesting challenges to meet the needs of all potential stakeholders.